With any pizza restaurant that is not 100% gluten-free, there is always a chance of cross contamination. Pizzeria Paradiso is up front in acknowledging that and does take steps to curtail cross contamination for sensitive customers. "Our dough is prepared in a thoroughly cleaned mixer. It is then shaped on a thoroughly cleaned prep table and partially baked in a traditional oven that has also been thoroughly cleaned before hand. They are then wrapped and frozen, awaiting a customer's order. Up to this point, the crust is as cross contaminate free as we can possible make it." When chatting with the waiter the night of, he said the kitchen would use clean utensils (including a cutter) and would bake the pizza on aluminum foil in the oven. Note that the gluten-free crust is dairy-free, but not vegan. 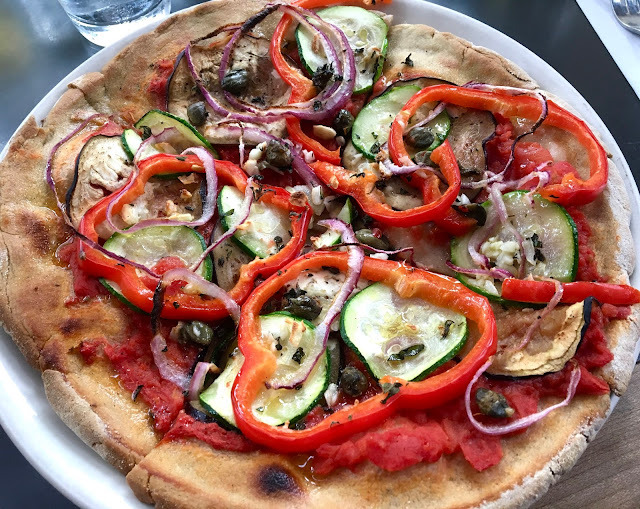 I ordered the Siciliana pizza sans cheese, which comes topped with tomato sauce, zucchini, capers, eggplant, garlic, red onion, and red pepper. When the pizza came out, I flagged the server to get a second confirmation that it was in fact gluten-free because it looked too good to be true. It was in fact the gluten-free pizza, so I eagerly took a bite out of my first slice. The pizza was wonderful in every way. The crust has the nice oven-fired flavor and is substantial enough to hold up the toppings without being dense or crumbly. The crust is thicker than most other gluten-free pizzas I have found, but in a great way that makes it more "normal" feeling. The toppings were fresh flavorful and has a wonderful Italian flavor. I had no complaints, and no issues polishing the 9" pizza off. 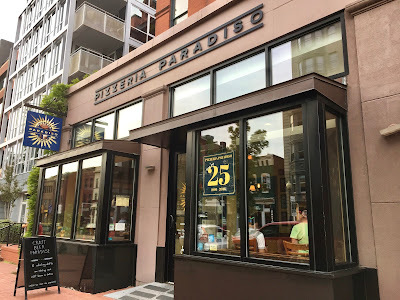 Pizzeria Paradiso (and it's sister restaurant Veloce) are the best gluten-free pizzerias I have found in Washington D.C. so far, and it's amazing to have both in close proximity to my neighborhood. With gluten awareness and understanding, they have brought the pizzeria experience to those of us with dietary restrictions. Regionally, Pizzeria Paradiso can also be found in Georgetown, Hyattsville (MD), and Alexandria (VA).